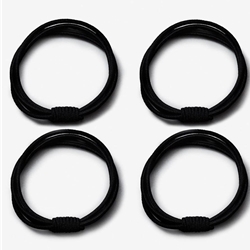 The Capezio® Hair Ties are available in Black, Blonde, and Dark Brown, and come in Adult One Size Fits Most. Each package includes 4 hair ties. Perfect for rehearsals and performances, these hair ties will keep ponytails firm and tight for a comfortable hold that lasts all day.